Refer to the exhibit. The network administrator has assigned the internetwork of LBMISS an address range of 192.168.10.0. This address range has been subnetted using a /29 mask. In order to accommodate a new building, the technician has decided to use the fifth subnet for configuring the new network (subnet zero is the first subnet). By company policies, the router interface is always assigned the first usable host address and the workgroup server is given the last usable host address. 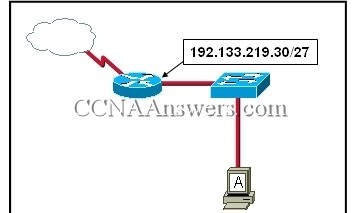 Which configuration should be entered into the workgroup server's properties to allow connectivity to the network? 6. What subnet mask would a network administrator assign to a network address of 172.30.1.0 if it were possible to have up to 254 hosts? 7. Given the IP address and subnet mask of 172.16.134.64 255.255.255.224, which of the following would describe this address? 9. What is the network address of the host 172.25.67.99 /23 in binary? 10. A router interface has been assigned an IP address of 172.16.192.166 with a mask of 255.255.255.248. 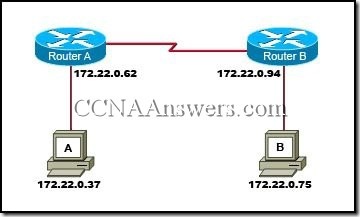 To which subnet does the IP address belong? Refer to the exhibit. Why would the response shown be displayed after issuing the command ping 127.0.0.1 on a PC? The IP settings are not properly configured on the host. Internet Protocol is not properly installed on the host. There is a problem at the physical or data link layer. The default gateway device is not operating. A router on the path to the destination host has gone down. The router will discard the packet. The router will decrement the TTL value and forward the packet to the next router on the path to the destination host. The router will send a time exceeded message to the source host. The router will increment the TTL value and forward the packet to the next router on the path to the destination host. The router will send an ICMP Redirect Message to the source host. 14. 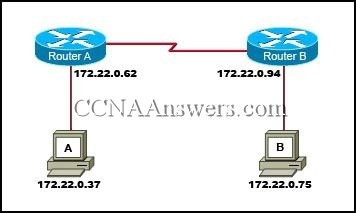 Which process do routers use to determine the subnet network address based upon a given IP address and subnet mask? 15. What is the primary reason for development of IPv6? 19. What is a group of hosts called that have identical bit patterns in the high order bits of their addresses?